Made by Hain, David in Sydney, New South Wales, Australia, 1947. 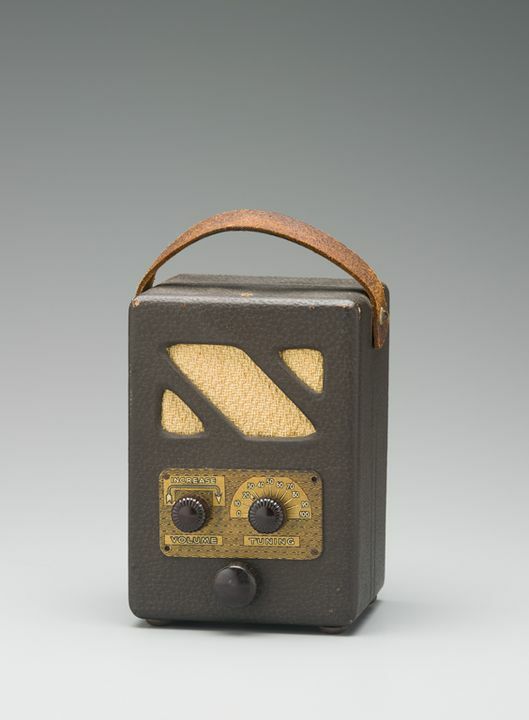 Portable wooden radio with textured brown vinyl covering and three slot speaker grille in upper half and three control knobs in lower half. Volume knobs on left and tuning on right. Plywood surround for knobs painted gold and white. Leather handle attached at either side. Two pieces of paper with hand drawn circuit diagrams in blue and black pen. One photographic print of the radio in a workshop with hand written notes on reverse. One copy of Radio and Hobbies magazine October 1947, Vol.9 No.7. Radio and Hobbies magazine October 1947, Vol.9 No.7, included this radio design in that issue. The R&H fixed the supply of chassis and cabinets with dial plate and knobs to match. The article on the "Handie Talkie" commencing on page 24 details the parts required and construction method for the radio.